Artist Unplugged: Unbelievable......Actually Painted Today!!!!!!! Hope you are sitting down....I actually started a painting today (sorry VolleyGirl, Maytagaramas can wait-a little). I LOVE clouds I've taken hundreds of photos. This is from one of them. It is a bit difficult to see the rays coming through at the bottom. Artist ~ I like this painting and I hope that you don't mine if I put it next to my article on my website. - Ray. Darn, it won't enlarge! Anyway, I love it. I love looking at the sky, too. It is so mysterious and everchanging. Fascinating. And you have done a great job with it. Love your flower Zentangle in the previous post too. Interesting painting. 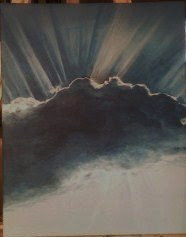 I have seen those rays coming through the clouds many times and wondered how I could paint them. Very good. Wow.. Is this a painting? It looks so real. Fantastic job. Oh, God. Very shocking photos. Oh. This is just fabulous! Good for you!! I thought at first your clouds were the painting! Hope we are going to see it. it looks like a great start! Hey, thanks for all the feedback! It is the painting that is posted and not the photo. Well done, it's fantastic. I love it. Oh that is stunning and I can see the rays at the bottom, gorgeous. I've just read your profile and I sing and act too (or rather did), haven't done any for a while now. This is a wonderful painting!